It wasn’t just Poe who found black cats spooky. They can be found in macabre Japanese folk tales as well. Such a story inspired social issues filmmaker Kaneto Shindo’s second masterful foray into the horror genre. 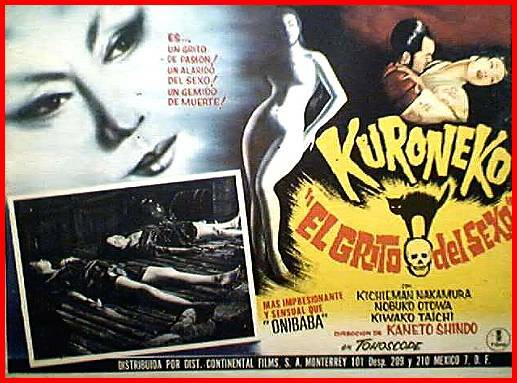 Though filled with supernatural dread and suggestion, perhaps the darkest aspect of Shindo’s Kuroneko (or “Black Cat”) is human nature itself, as can be seen in the glorious new back and white 35m print that will screen at Film Forum starting this Friday (trailer here). It was miserable to be a peasant in feudal Japan. Take Shige and her mother-in-law Yone as a case in point. Years ago, her husband was impressed off their meager land to serve in some futile war. While dutifully awaiting his return, the women were brutalized and murdered by a gang of rogue samurai. To conceal their crimes, they torched the bodies and razed their home. Yet, this one black cat witnessed it all. Sometime later, newly christened samurai Yabu-no-Gintoki is ordered by his Mikado to investigate a series of murders by the Rajomon gate. It seems many of his samurai brethren have had their throats ripped out and their blood drained. 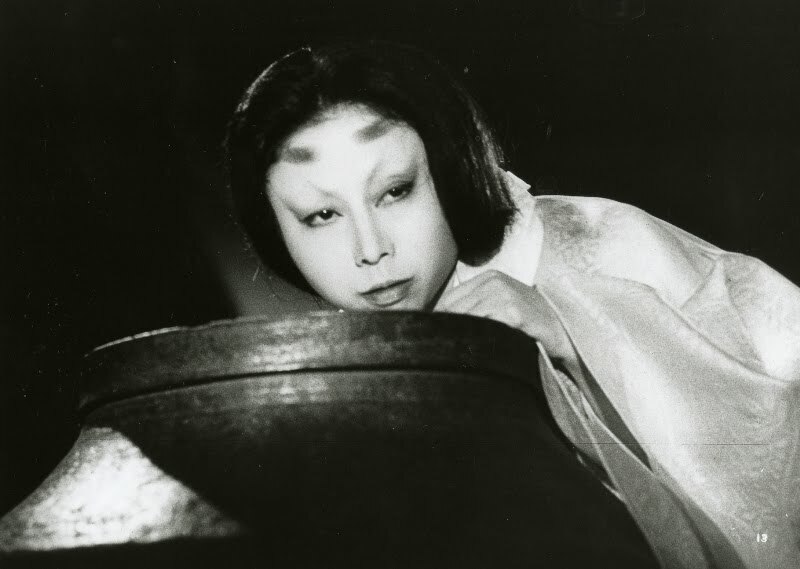 As we have witnessed, two vaguely feline wraiths whose features resemble Shige and Yone have been luring arrogant samurai back to their quarters for an evening of sake and seduction that culminates in some serious pay-back. However, when the three come to suspect they are all part of the same family unit, it creates a bit of a karmic quandary. In contrast to the lush Kwaidan, Kuroneko has a stripped-down, minimalist ambiance. While Shindo’s staging has often been likened to kabuki and noh theater, there is also definitely a film noir vibe to Kiyomi Kuroda’s cinematography. Shindo’s lefty filmmaker sensibilities inform the proceedings as well, clearly positing a worldview in which peasants are routinely exploited, with the women victimized the most. In fact, Shige and Yone’s suffering does not end with death. They still find themselves making sacrifices, if we are to believe what were told. Of course, Kuroneko has its ambiguities (which might allow Gintoki room for denial). Indeed, the unsettling performances of Nobuko Otowa and Kiwako Taichi, as the otherworldly mother and daughter-in-law play an essential role in keeping viewers off balance. Taichi projects a delicate vulnerability, even when in the throes of blood lust. Otoya on the other hand, i s fierce and scary, but also lays a guilt trip on Gintoki (and by extension the audience) truly worthy of a mother. To mangle the Truman quote, if you want to feel good about humanity buy a dog, don’t look to Japanese horror films. The implications of Kuroneko’s terrors run awfully deep. Unquestionably dark but frequently visually arresting, it is one of the few horror films (along with Kobayashi’s Kwaidan) that constitute true cinematic art. It begins a special one week run at New York’s Film Forum starting this Friday (10/22).